 PDF Viewer implements a feature called 'Wi-Fi Drive'. It gives you the option to access the files from your browser or any WebDAV client. PDF Viewer implements a feature called 'Wi-Fi Drive'. 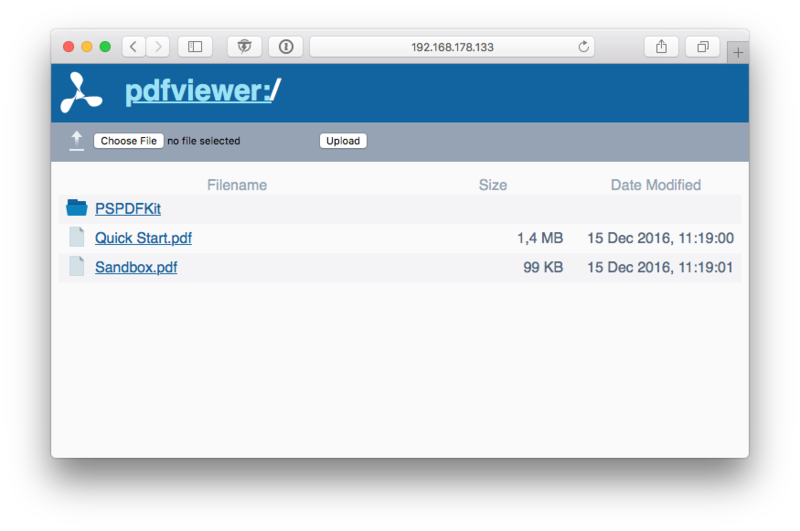 It gives you the option to access the files in PDF Viewer from your browser or any WebDAV client on your local network. 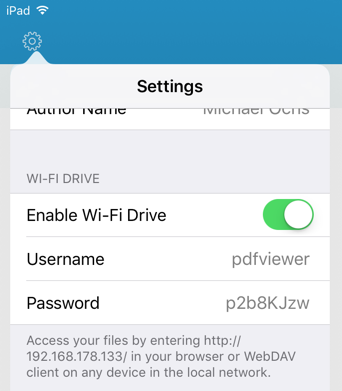 It is an easy option to transfer files from and to PDF Viewer without the need to connect your iPhone or iPad to your computer or to use a cloud provider. Wi-Fi Drive entirely works on your local network, without the need of an internet connection. Wi-Fi Drive is disabled by default. You can switch it on in the settings menu under the 'Wi-Fi Drive' section. Once enabled you will see the address of your device at the bottom of this section. When connecting, you will be asked to provide the username and password that is shown right under the switch you tapped to enable the server. As long as you keep PDF Viewer open, you can connect to this address to access you files. 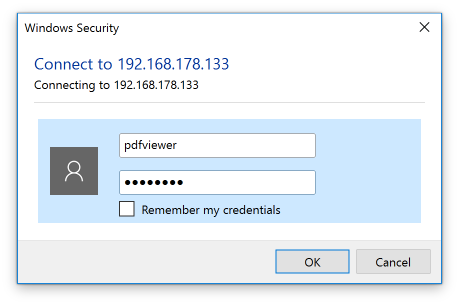 As a security measure, after you closed PDF Viewer and ongoing file transfers finished, new connections will not be accepted. When you want to access your Wi-Fi Drive again, you need to open PDF Viewer and enable the drive again. This is so that other people can't access your files when you are traveling and your device may be connected to an unknown network. You can change the username and password by tapping it. The changes take effect as soon as you hit return and ongoing connections will be terminated. You can use your favorite web browser to connect to the Wi-Fi Drive. 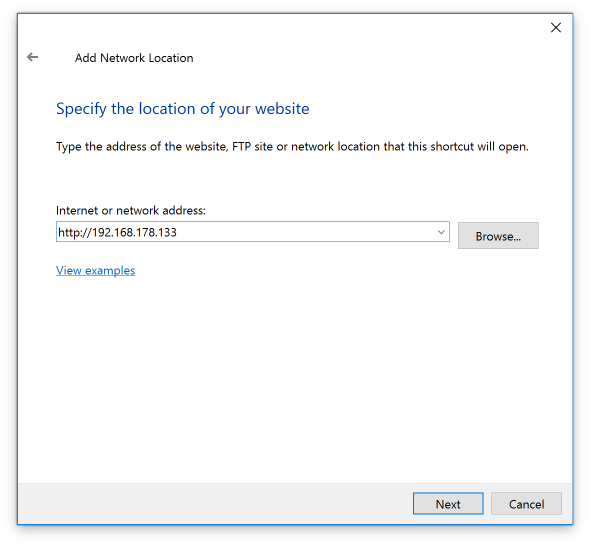 Just type the address you see in the settings menu into the address bar of your browser. In the web browser you can download and upload files and browse the My Documents directory of PDF Viewer. To open a folder or a file, you just click on its name. To upload a file, you navigate to the folder you want the file to upload to and then click the 'Choose File' button. After selecting the file you want to upload, click on 'Upload' and the website starts uploading your file. Once the upload process finished, the current directory is reloaded. PDF Viewer will also update automatically, if you uploaded a file to the folder you are currently looking at. You can use any WebDAV client you want, as long as it supports Digest Access authentication. Most clients do support this as its the recommended authentication method for WebDAV. Wi-Fi Drive has been tested on macOS with Finder and ForkLift. If you use a WebDAV client that supports Bonjour services, like the upcoming ForkLift 3, you don't even need to type the address of the Wi-Fi Drive, it will automatically show up as soon as it is enabled. 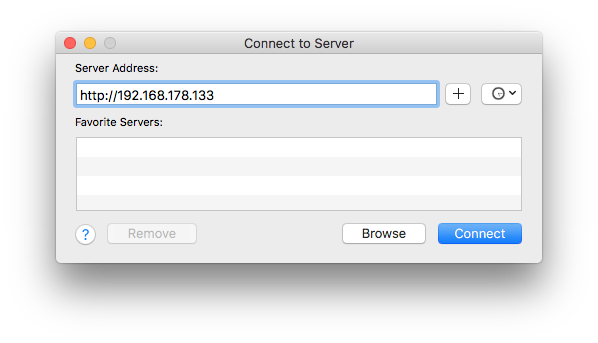 If you want to use macOS Finder, all you need to do is open a Finder window and choose 'Go > Connect to Server...' from the menu bar. This opens a new window where you can enter the address of the Wi-Fi Drive and then click on 'Connect'. In the next step Finder will ask you to authenticate. 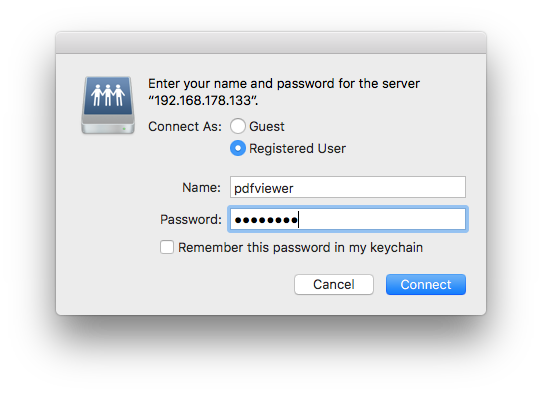 This is where you enter the username and the password from PDF Viewer's settings screen and click on 'Connect' again. 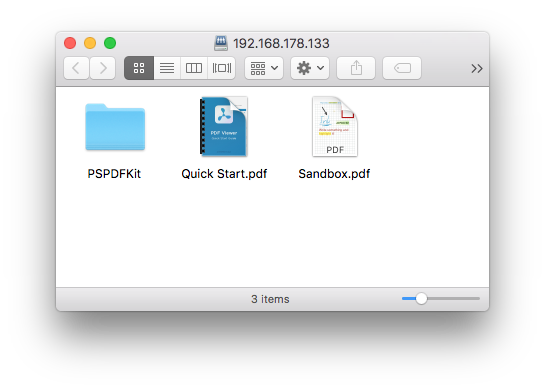 Finder now connects to PDF Viewer and opens a new window that contains all the documents and folders you see in PDF Viewer. You can now copy and move files around from and to this folder like you would do with every other folder on your hard drive as well. Like macOS, Windows 10 has a WebDAV client integrated. 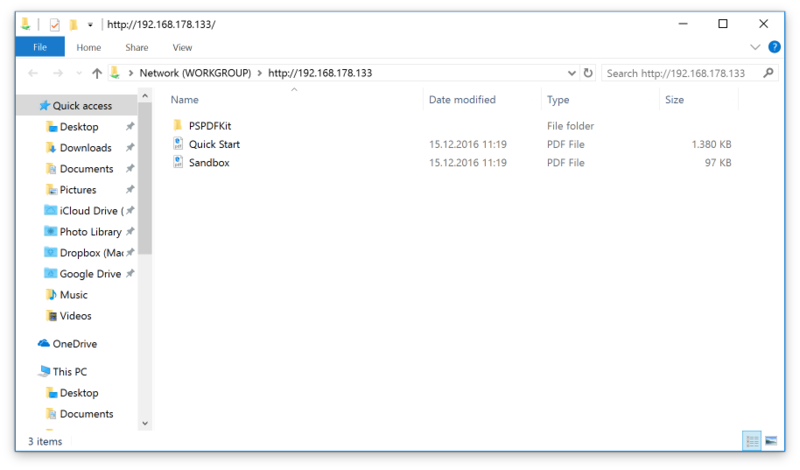 To connect to PDF Viewer in Windows 10, open a new File Explorer window. Select 'This PC' in the sidebar on the left. Right click anywhere in the File Explorer window and click on 'Add a network location'. In the first step, all you need to do is to click on 'Next'. In the second step, make sure 'Choose a custom network location' is selected and click 'Next'. In this step you can enter the address of the Wi-Fi Drive and then click on 'Next'. In the next step Windows will ask you to authenticate. This is where you enter the username and the password from PDF Viewer's settings screen and click on 'OK'. Windows now gives you the option to name the remote folder you are about to create. You can either use the default value, which is the IP address of PDF Viewer, or enter something more meaningful. Then click on 'Next'. In the last step, Windows will tell you that it connected to PDF Viewer. Make sure the option 'Open this network location when I click Finish.' is checked and then click 'Finish'. File Explorer opens a new window that contains all the documents and folders you see in PDF Viewer. You can now copy and move files around from and to this folder like you would do with every other folder on your hard drive as well.